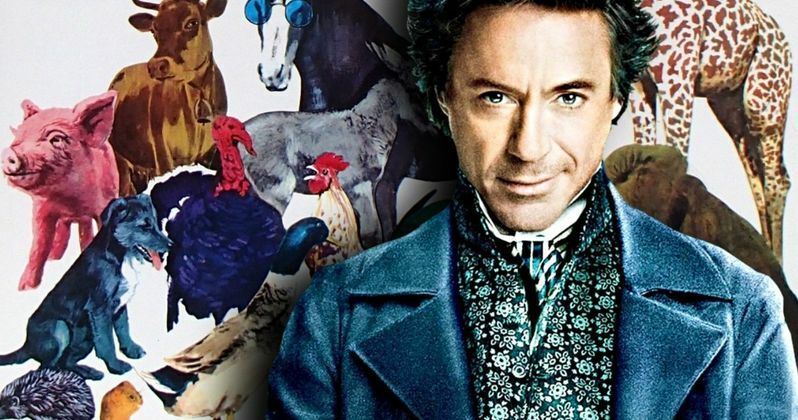 Robert Downey Jr.'s The Voyage of Doctor Dolittle brought Teenage Mutant Ninja Turtle director Jonathan Liebesman on board to handle some reshoots. The movie has been pushed back a few times now and was originally set to come out this month. However, there have been some changes behind-the-scenes in order to get the look and feel just right. Liebesman was brought on board, but he worked closely with original director Stephen Gaghan, who was on set the whole time during the 21 days of additional shooting. The LEGO Batman movie director Chris McKay had previously come on set to help out on The Voyage of Doctor Dolittle, which is a live-action/CGI hybrid. Sources close to the project say the studio and producers Susan Downey, Joe Roth, and Jeff Kirschenbaum, knew last fall there were some pretty substantial changes that had to be made. With that being said, reshoots are very common on big budget projects these days, especially when there is a lot of CGI work because only about half of the digital effects are done during principal photography. Robert Downey Jr. is going to be talking to a lot of CGI animals in The Voyage of Doctor Dolittle, but Stephen Gaghan reportedly wasn't able to pull off the right tone on his own. This meant the movie had to go through a bit more than just reshoots and is the main reason behind the release delay. Chris McKay (Robot Chicken) was brought on to help out and he ended up reshaping the tone of the movie while adding some new writing, but he wasn't available for the reshoots, so Jonathan Liebesman was brought on to work with Stephen Gaghan. Stephen Gaghan will still receive the directing credit on The Voyage of Doctor Dolittle and reportedly only needed help with the hybrid aspect of the movie. Chris McKay and Jonathan Liebesman come from that world and were able to give the movie the overhaul it needed, which has added to the post-production time. Reshoots have gone on to incredibly help out major budget projects and they have also torched them. Check out Justice League for a reminder. However, The Voyage of Doctor Dolittle has kept Stephen Gaghan on at every stage of the new shoots, making sure his original vision is not compromised. We're going to be seeing Robert Downey Jr., who has starred in a lot of CGI-heavy projects over the years, talk to animals, which means that look has to be just right and it has to have its own feel. When you're coming off of Infinity War and Avengers: Endgame, the digital effects have to be on point. With that being said, The Voyage of Doctor Dolittle will finally hit theaters on January 17th, 2020. The Hollywood Reporter was the first to announce the reshoot news for The Voyage of Doctor Dolittle.